One thing that you are certain to notice when you become a cat owner is the amount of time that your cat will spend asleep! Tortoiseshell cats and kittens can be full of energy, playing and interacting with their owners as well as getting out and about in the garden and the neighbourhood – but they will also spend a huge amount of time curled up in their favourite bed fast asleep for hours. So why does your boisterous ‘tortie’ transform herself from a rampaging ball of fur to a slumbering zombie for up to 15 or 16 hours per day? One of the main reasons is that cats don’t have any natural predators, so she knows that she can afford to curl up under the radiator for an afternoon nap without any fear of coming under attack (unless you have young children!). Secondly, she is conserving her energy for when she is going to be on the attack herself – you will notice her stalking bugs, insects and all sorts out in the garden, or toy mice, balls and other objects in the house. All of this stalking takes up lots of energy which she builds up by sleep, conserving it for when it is needed. The weather can have a big impact on your tortie’s sleeping patterns – you will notice during these first few days of spring that she will love to get out and about if it is a nice, warm and sunny day. However, as soon as the rain and clouds come back (which happens a lot here in the UK! ), she will most likely return to her favourite sleeping spot. You will notice that your tortie’s sleeping patterns vary between deep sleep when she is out for the count, and much lighter sleep when she can wake at the slightest noise and be instantly on the alert. And cats really do ‘cat nap’, rather than extended 8 or 9 hours of sleep like humans enjoy. How long does your tortie sleep for? 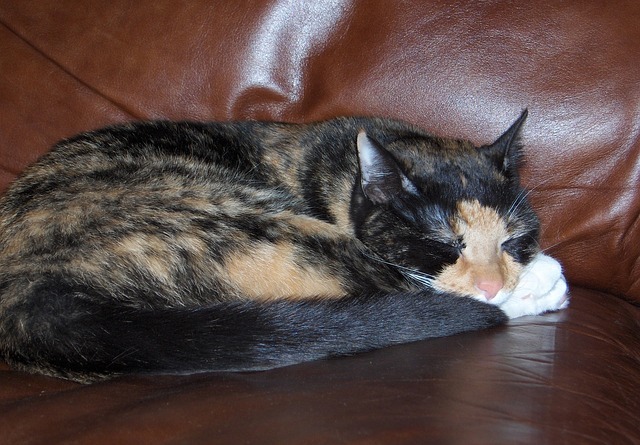 Send us your cute pictures of your tortie curled up in her favourite spot and we will feature her in our gallery!